Disney is set to report third-quarter earnings after the closing bell Tuesday. Millennial investors were snapping up shares ahead of the release, with 65,000 investors on Robinhood holding the stock. Investors will be looking for details about its proposed $US71 billion buyout of 21st Century Fox. 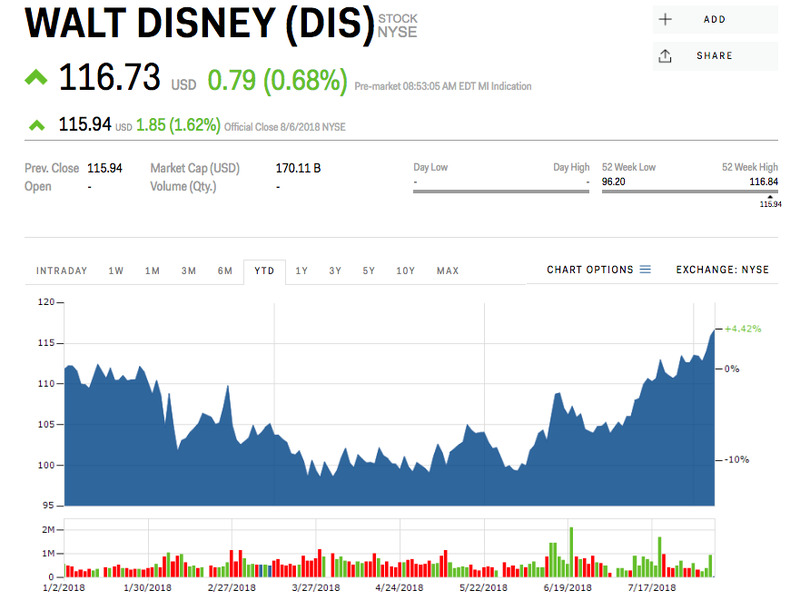 Follow Disney’s stock price in real-time here. Disney’s proposed $US71.3 billion acquisition of 21st Century Fox is sure to be the focus of Tuesday’s earnings report from the entertainment giant – and millennial investors seem to be optimistic. Ahead of the company’s third-quarter earnings numbers after the closing bell, investors on the stock-trading app Robinhood who owned Disney totaled 65,744. That’s up more than 2.5% since July 2, when 64,137 held the stock, and well outside its usual weekly moving average of 600 since Business Insider first began tracking the data in late-June. Disney first bid for 21st Century Fox’s production assets in December 2017, offering $US52.4 billion in stock for the conglomerate’s production assets and some channels excluding Fox News, Business, and Sports channels, which will be spun off as “New Fox.” Comcast then set off a bidding war by offering $US65 billion cash in June, and dropped out after Disney’s $US71.3 billion offer a week later. Both companies’ shareholders have approved the merger, but the deal’s completion is still at the hands of regulators in the US and internationally. For the quarter ended June 30, analysts expect Disney to post earnings of $US1.94 per share on revenues of $US15.63 billion. And even once completed, the Fox buyout will mean more work is ahead for Disney. “Even after spending $US80-90 billion, we believe Disney will need to further invest many incremental billions per year for many years on content (in the form of foregone licensing, as well as new original content), plus marketing and tech/ops, to launch its direct-to-consumer products and give them the best chance for success,” Todd Juenger, a media analyst for Bernstein, said in a note this month. 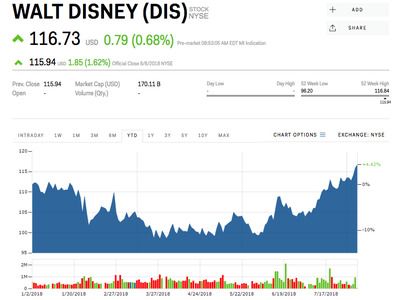 Shares of Disney are up 4.4% since the beginning of the year.